At 3:30am on Sunday the 11th of October, our journey began. After a five hour coach ride to Manchester, a stressful walk through Manchester Airport security and an eight hour flight we landed in Florida. Once we had unpacked, eaten dinner and cooled off in the hotel pool we settled in for the night, all looking forward to the week ahead. Day One: Universal Studios And Wonderworks! At the Universal Studios Theme Park we were lucky enough to be given a behind the scenes tour. We had an exclusive look at how their different rides work, from the mechanical aspects to the special effects. We were also given information on different things they do around the park for example how they have thousands of audio clips playing at once in different locations, from small bits of dialogue in Cartoon Island to loud rock music in Marvel Island, all to add to the atmosphere. Once the tour was finished we were given some free time to enjoy ourselves in the park before we headed back for Wonderworks. Wonderworks began with a dinner of unlimited pizza and yes, it was as amazing as it sounds! All accompanied by a magical-comedy performance. We then went on to walk around the building where we experienced minor hurricanes or earthquakes in simulators, had a go in a human gyroscope, played laser tag, went on a high ropes course and got an impromptu lesson on black holes from Mr Call using a penny drop. Day Two: SeaWorld and the NBA Game! We started off the day at SeaWorld where we were given a tour and got up close and personal with some of their sea creatures like manatees, seals, sting rays and sharks. 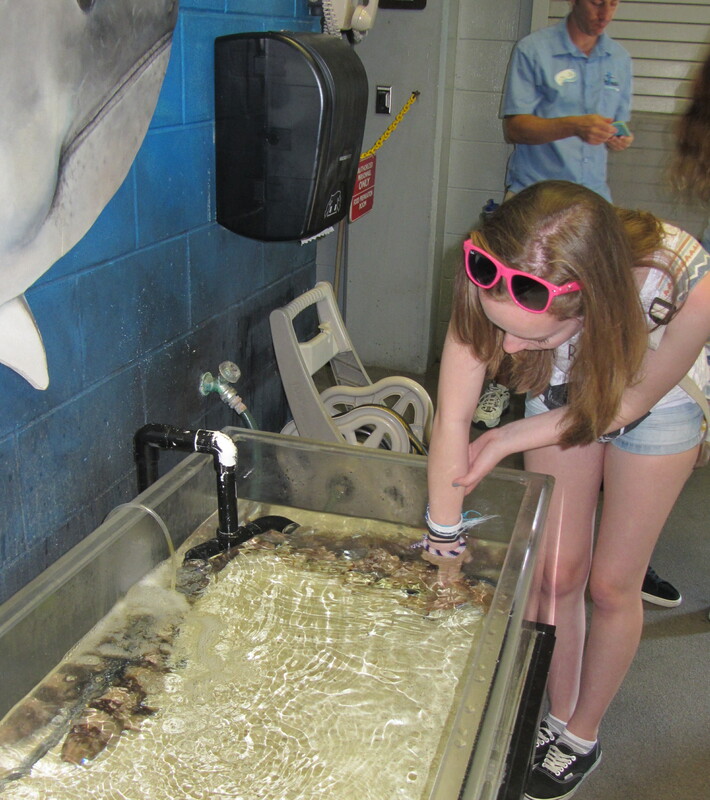 We got to stroke the sting rays and sharks too! Then we got taken to watch the sea-lion and otter performance and the orca show. Once these were finished our tour guide bid us farewell and we were given free time to go aroundthe SeaWorld theme park. After SeaWorld we sped back to the hotel and then left again in time to get to the basketball game. We were sat really high up in the stadium, Orlando Magic won and we got to go down and take a photo on the court when the game was finished, so it was a great experience! Day Three: Busch Gardens! Unfortunately the education programme at Busch was no longer running so our teachers became our tour guides. They explained some of the things that we might have learned and took us all on the train ride round the safari to see all the animals. After that we were given free time to look around, look at some animals and go on rides. Busch gardens was definitely one of my highlights as it was the first time I have ever seen a white tiger in real life and the first time I have been brave enough to ride a roller coaster. When we got back from Busch gardens we were given the choice of staying and relaxing in the hotel, going out to the shops or going to a nearby arcade before we had to come back and go to sleep. Day Four: Wet ‘n’ Wild and Shopping! Wet ‘n’ Wild was definitely one of the most enjoyable activities on the trip. We were given the majority of the day to rest on the loungers, swim in the wave pool and go down the water rides. It was a nice change from the fast pace of the previous few days. After our swimming, relaxing and ‘tanning’ session we were taken to a huge shopping outlet where we got to spend a considerable amount of our holiday money. Day Five: NASA! Breakfast at 6:30am and then we were on our way. As soon as we got there the cameras were out and we were taking group photos in front of every cool-space-looking-thing we could find. We then got shown into an atrium and got to hear talks from both our guide and an astronaut, John Blaha. It was very interesting how Blaha focused more on his childhood and what lead him to his incredible career than his actual journeys out into space. We were then challenged to build a rover out of a limited supply of basic stationary supplies and a few of the groups who either won or came second were awarded prizes. Later on we got a tour around the rocket garden and a coach out to see the massive buildings where they build and assemble the rockets. Without a doubt, the most impressive part of the NASA trip for me was walking under the Saturn V rocket and taking in its incredible size. After getting some souvenirs from the NASA gift shop we headed back for our last night in the hotel. Day Six: Re: Universal Studios and the Journey Home! We were surprised by the teachers with an extra day on the other side of the Universal Studios Theme Park, meaning we could go on everything we missed on Monday. It was a really nice way to end the trip. From there it was a simple 13 hours or so of journeying until we arrived back at school and – despite the fact that we would miss the sun, the brilliantly unhealthy food and the jam-packed schedule – I think we were all glad to be home for a rest.